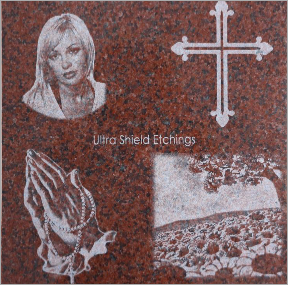 All monuments will be custom designed to match your memorial’s vision. When you visit our locations, you can browse through the hundreds of complete designs and design elements we offer. All of our designs and components can be tailored to your liking. We know that the design and imagery are intended to commemorate your loved one and we will work to design a monument that does exactly that. We can include any imagery that speaks to the character, hobbies, and personality of your family member. For instance, your design may include religious symbols, flowers, animals, scenic backgrounds, portraits, athletic icons, and much more. 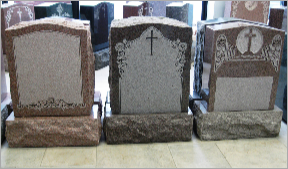 Memorials traditionally include the family name, names and dates of the deceased, and epitaphs. 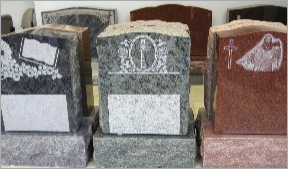 Your cemetery may have lettering restrictions including the use of approved epitaphs. As with any restrictions on size and shape, we will guide you through this process.